I ordered the EVDO data plan for my new cell phone, which allows me to be online with “broadband” on my phone anywhere. That’s $40/mo. If you want to hook it up to your laptop and use it as an external modem, you have have to pay an extra $15/mo for the privilege of connecting the two via USB cable. They turned off the Bluetooth data option, so that you can’t do it wirelessly. It’s worked great on the phone, but today was the first day that I hooked it to my computer. 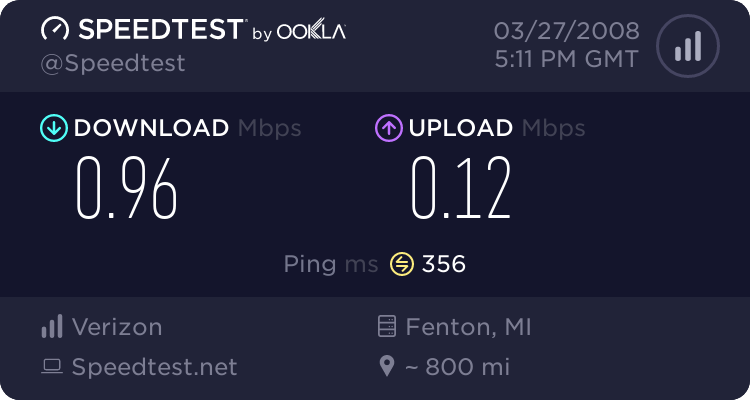 I ran a speed test through SpeedTest.net. It’s not bad, certainly better than dial-up, and it works on the road etc. I just wish it didn’t need a wire. Just browsing, I didn’t really notice a difference between this speed and my cable modem. Transferring files would presumably be much slower. If you had bluetooth, could it become your home’s wireless router too?